The remedial assignment continues as Soul and Maka confront Dr. Franken Stein, the man behind Sid-sensei's unfortunate transformation and the strongest meister ever to graduate from Death Weapon Meister Academy. Even without a weapon, his massive soul dwarfs them all-even big shot Black*Star! Can Maka rally her strength to face Stein in battle, or will despair be her downfall? So I was content to stop at volume one, but a teen shoved this into my hand and not so politely insisted that I continue. 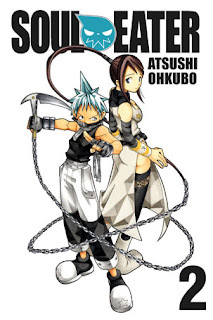 Volume two complete, and I'm still not sure what to think of Soul Eater. At the end of volume one, our meisters and the scythes they wield, have been sent to a remedial school to improve their skills. They are searching for souls to eat. The more souls you eat, the more powerful you become. But our motley crew is really bad at it and desperately needs the help. Now their under the tutelage of Dr. Stein, a meister who very much resembles of the monster of fame. The first lesson shows the weaknesses of the whole crew. Soul Eater and Black Star are just ridiculous, and Death the Kid is a mess of obsessive compulsiveness. Then they meet Crona and Witch Medusa and things get even more complicated. There are a lot of people I'm having trouble keeping straight, and a lot of personalities that are way over the top. SO that's where I'm at...being forced to read and not really sure what to make of it all. Maybe I should try the anime?? ?